Andrea Sottimano and his father Rino produce wines of outstanding quality from thirteen lovingly cared for hectares in the Cottà, Currà, Fausoni, Pajoré and Basarin crus in the Treiso and Neive townships. Their Barbarescos are elegant, evocative, subtle and yet hearty – to taste these crus side-by-side is to reply with a resounding YES to skeptics of terroir that question whether differences of only 200 meters does matter! The approach here is one of minimal intervention: indigenous yeasts, no fining or filtering. No insecticides are used and only organic fertilizers are used, and only minimally. Natural cover crops (grass cover) are left in the rows between the vines and are mowed 2 or 3 times a year. In autumn the soil of every other row between the vines is tilled. 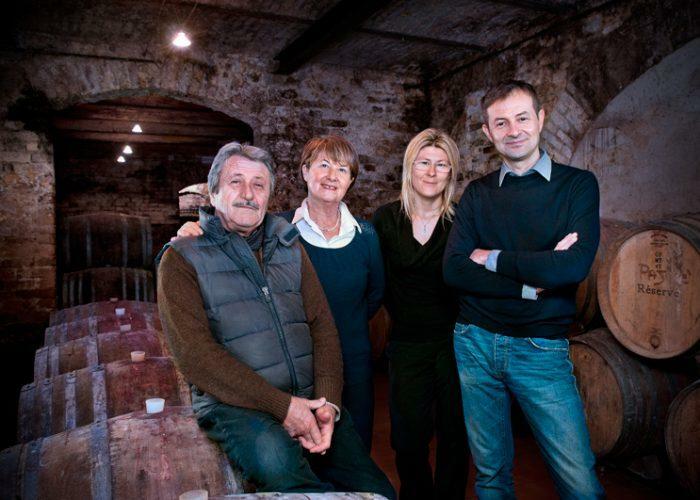 Each of their four cru Barbarescos are given the same treatment to allow the uniqueness of each cru to express itself. Fermentation is done in oak, of which about 30% is new, followed by 18-20 months in neutral barriques. The "Cottà," always the most fruit-driven of the crus, comes from 25-year old vines and features notes of red and black fruits and refined nuances of mint.The "Fausoni," from 40-year old vines, is the softest and most floral of the four, with trademark notes of mint and licorice and a firm core of vibrant acidity; elegant "Currà" is a big mouthful, extracted and built for the long term. The more traditional "Pajoré" from the Treiso area is the epitome of elegant austerity, with striking balance and perfect ripeness. 2004 saw the first release of a Barbaresco Riserva, made from a selection of old vines in the Pajoré and Cottà vineyards. Dolcetto "Bric del Salto" and the dry, still Brachetto "Mate" are also stunners from Sottimano, as is the barrique-aged Barbera "Pairolero" and the Langhe Nebbiolo, made entirely from declassified Basarin fruit. To experience these truly singular wines is to understand why they are rare gems indeed. Vinous Media 92 "The 2013 Langhe Nebbiolo is a real stunner. Translucent and weightless in the glass, with tons of pure pedigree, the 2013 hits all the right notes. Sweet lavender, mint, violet and sage notes lift from the glass in a precise, aromatic Nebbiolo to enjoy over the next decade or so.